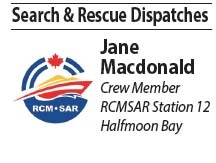 Weather as duty crew on a fast response craft or as a supporting member in our Society, consider volunteering with RCM-SAR 12. Station 12 and the Sunshine Coast Marine Rescue Society are currently looking for new members. Training, camaraderie and experience on the water are just a few of the benefits our members enjoy. The 2016 Active Duty Crew training program begins soon. New Crew interviews and orientation will be held in late September. Classroom and on-the-water training begins in October. The Sunshine Coast Marine Rescue Society raoses funds and awareness for Station 12. The Society is looking for accounting, event planning, public engagement and education skills. Please attend our open house on Thursday, September 15th from 6-8pm at the Seaside Centre in Sechelt. install a life ring at the pier in Davis Bay. After overwhelming support from the District of Sechelt and the Sunshine Coast Regional District. nine more rings will be installed at nine other beaches. In the event of an emergency, it would take RCM-SAR about 30-40 minutes to get to the scene. In addition to Davis Bay, life rings will be going in on wharves and docks in Porpoise Bay, Secret Cove, Halfmoon Bay, Trail Bay, Whiskey Slough and Pender Harbour. – See more about this story on the Coast Reporter Newspaper. The all-volunteer crews of both Sunshine Coast Search and Rescue teams (Land and Marine) have had a busy summer with taskings and continuous training exercises. A few close calls remind us of how quickly good intentions evaporate in the absence of good planning. We understand accidents happen; that’s why we remain on call 24/7/365. On the water, Royal Canadian Marine Search and Rescue volunteers responded to a call at midnight recently when a small vessel carrying several enthusiastic campers lost power. The 3.5’ swells and heavy winds off North Thormanby Island required a swift response. After a search, our crew found the vessel (and its frightened passengers bracing the waves) thanks to their mobile devices. The only functioning light source on board. SOS signals from a handheld phone can work, as evidenced by the rescue however, having a flashlight, flare or strobe is required. More importantly, “wearing” a life jacket or personal flotation device is vital in situations where Mother Nature is working her powers. Being safe trumps vanity, every time. All boaters are reminded to “wear” their PFD’s. On Land, there were two call outs to assist with BC Ambulance Service. One at Skookumchuck Narrows Provincial Park, the other at Smuggler Cove. Both calls were to assist elderly hikers and were resolved without injury. Please remember to bring plenty of food and water when out on trails. Be aware of potential fire situations and report wildfires immediately. Complimentary Pleasure Craft Safety Checks were conducted by crew members at Secret Cove Marina in July. Over a dozen boat owners were treated to friendly boat safety and equipment inventory inspections by members of Station 12. Passing a Pleasure Craft Safety Check inspection ensures boaters have the right equipment on board, and qualifies boaters to receive discounts on insurance coverage. A precaution that pays. Join our volunteer rescue team! Rescue crew warming up at the Polar Bear Swim 2015 in Davis Bay. Even if you don’t know the green side from the red side or the pointy end from the flat end, Royal Canadian Marine Search and Rescue appreciates your interest. This could be your opportunity to join a diverse team of fun people who like to learn new skills while contributing back to their local community. RCMSAR is a volunteer organization with the mission to save lives on the water. Achieving this mission requires people with a range of skills and experience, for both active SAR positions and support positions. The regional organization is made up of more than 1,200 men and women from juniors of 16 years to seniors in their 80s, with every sort of education or background experience. Volunteers are trained to respond to all sorts of marine emergencies. We also help in areas such as administration, vessel maintenance, fund-raising and boating safety/education. Becoming an active SAR crew member requires passion, energy and time. The reward is friendship, fun and helping those in need. As well as on the water crew there are also management roles and supporting positions available. Ongoing training is provided both on the water and in the classroom at no personal cost. This a requirement for maintaining active status. Training includes skills such as boat handling, seamanship, navigation, radio operations, first aid, search and rescue and collision regulations. All RCM-SAR stations are under the same overall organization and operate in the same manner of volunteer crews and supporters. Utilizing and maintaining modern, well equipped, purpose built rescue vessels, we remain at the ready 24 hours a day, 365 days a year.